Almost no passerby has that minute, let alone $20 to donate to the cause. What most people have is a scowl, a dismissive wave of the hand and the accelerating stride of a running back. In a city synonymous with Al Capone, do-gooder appeals are about as practical as a citizen’s arrest. But although 2.8 million residents of Chicago may scoff at the notion that noble intentions can stop climate change, that doesn’t mean they think the problem can’t be solved. The city’s leaders know that to get people to save the earth, you must appeal to their bank accounts, not just their consciences. And those leaders are putting their reputation on the line to prove it. In September, Chicago unveiled an action plan to reduce carbon dioxide emissions to one quarter below 1990 levels by 2020, followed by reductions through 2050 that would slash emissions by 80 percent. Up to 400,000 homes and 9,200 skyscrapers and factories would require energy-efficient retrofits in the next 12 years. All 21 coal-burning power plants throughout Illinois would need to be refurbished, too, requiring statewide cooperation. Another 450,000 riders would have to wedge themselves into elevated trains and buses every day—a 30 percent increase—rather than commute by car. “I don’t know of another municipal plan that is this ambitious or comprehensive,” says Rebecca Stanfield, a senior energy advocate for the Natural Resources Defense Council. The timing is right. Because the U.S. government has declined to support international treaties and emission caps, fixing climate problems has fallen to cities and states, many of which have a serious head start over Chicago. Portland, Ore., has already cut its per capita emissions to 12.5 percent below 1990 levels by making greater use of public transportation and drawing 10 percent of its electricity from sources such as hydro and wind. In Seattle emissions are 8 percent below 1990 levels, a figure that could slide further once a light-rail line connecting downtown to the regional airport opens next year. Two years ago California governor Arnold Schwarzenegger pledged to bring the entire state’s emissions down to 1990 levels by 2020 through higher fuel standards and the capture of methane from landfills, among other strategies. But none of these places must overcome the heritage of steel mills and stockyards that haunts Chicago. The worst air in the nation hangs over the metropolis, according to an Environmental Protection Agency database of chemicals that area companies release into the atmosphere. Younger cities can claim the mantle of the green movement in part because they never inherited a culture bred on coal, abundant in Illinois. “It’s a little unfair to compare different cities in different regions,” says Pat Hogan, regional policy coordinator for the Pew Center on Global Climate Change. “Places like Seattle and Portland can achieve carbon neutrality largely because they depend on hydropower.” Not to mention that unlike cities on the West Coast, Chicago endures extreme winters and summers that keep radiators and air conditioners running full blast. All these liabilities make Chicago a definitive test case in the fight against global warming. Most U.S. cities resemble Chicago: aging infrastructure, hulking factories, old power grids, and voters with a fierce loyalty to fossil fuels who are more likely to be watching TV than climbing mountains. If Chicago can slash greenhouse gas emissions, then any city can. Sadhu Johnston is in charge of making the Chicago Climate Action Plan something more than 60 colorful pages printed on recycled paper. Johnston, 34, looks young enough to be mistaken for a college student, instead of the Chicago government’s chief environmental officer. His first name originates in Sanskrit, referring to Hindus who live outside of society to contemplate the nature of God. Johnston works for the closest thing the rough-and-tumble world of Chicago politics has to a deity: Mayor Richard M. Daley, who as the eldest son of “mayor for life” Richard J. Daley assumed office in 1989, a year before Johnston could legally drive. Daley recruited Johnston from the Cleveland Green Building Coalition about five years ago. Together they are attempting to rebrand the Chicago of the mob, the meatpackers of Upton Sinclair’s The Jungle, and the 1919 Black Sox Scandal as the vibrant hub of the green economy. A revamped Chicago would attract alternative energy manufacturers and the thousands of new jobs such companies stand to create. The Windy City already serves as the North American headquarters to seven wind power companies and will host the industry’s annual conference in May. The largest turbine manufacturer, Suzlon Wind Energy, originated in India and came to Chicago in 2005 with 10 employees. It now has 900 workers stateside and expects to add 100 in 2009. Under Johnston and Daley, Chicago has already taken some green strides. The city has extended bike lanes for 120 miles, encouraged 400 building owners to plant vegetation on their roofs to soak up carbon dioxide and reduce storm-water runoff, and developed a “waste-to-profit” network that turns leftover plastics and chemicals from one company into useful raw materials for another. But in the fight against global warming, such strides are rather small steps. Chicago will churn out about 37 million metric tons of greenhouse gases this year. Covering the city with 6,000 green roofs, as intended, would trim emissions by only 170,000 metric tons. Carving out 500 miles of bicycle trails would eliminate a mere 10,000 metric tons. Together these strategies would lower total emissions by a grand total of half of 1 percent. To make a real difference, the Daley administration has embarked on an effort rivaling the city’s reconstruction after the 1871 fire, which gutted 18,000 buildings and left 100,000 homeless. Johnston, nonprofit officials and energy industry executives crafted a plan that aims to cut total emissions by 15 million metric tons by the 2020 deadline. The plan includes no sweeping mandates or legislative proposals. Its success hinges primarily on the government encouraging dramatic actions in the private sector. One third of the envisioned cuts result from landlords and businesses that are renovating buildings to make them more energy-­efficient. Another third come from upgrading pollution-preventing technology in existing power plants, in addition to receiving more clean power courtesy of a state mandate that 25 percent of electricity output be renewable by 2025. Of the final third of cuts, more than 20 percent come from better public and commercial transportation, with the rest owed to reductions in industrial pollution and the recycling of old refrigerators and air conditioners that leak hydrofluorocarbons. Supporters—and one would be hard-pressed to find anyone in the Chicago environmental community willing to openly criticize the plan—say it is feasible, but previous experience justifies skepticism. Seven years ago Daley promised to reduce the city government’s carbon emissions by 1 percent a year beginning in 2003. But in 2006 the city generated about 70,000 more metric tons than it did in 2003, according to records obtained by the Chicago Tribune. Johnston claims the city was under its targets in the first few years and banked the credit, keeping its average reduction to 1 percent a year. He is unapologetic. “Sometimes I think the media feels it needs to be the cynic or critic of government action,” he says, adding that the city is now meeting its reduction targets. Environmentalists were disappointed that the plan does not address the city’s biggest polluters. The half-century-old Crawford and Fisk coal plants, located within city limits, spew 4.8 million metric tons of carbon dioxide a year—that’s one third of the desired reduction right there. Chicago could ensure the plants’ closure by approving an ordinance that orders them to install costly scrubbers for nitrogen and sulfur oxides emissions, effectively putting them out of business. But some question the legality of such an order. The plan only suggests the plants could improve—likely because tangling with Midwest Generation, which owns the plants, would be difficult. Emissions from O’Hare and Midway airports are also spared—common practice in large cities, presumably because thriving airports are central to prosperity. Essentially, the whole thing is an experiment in civic leadership, a question of whether Chicago can cajole its population to act out of choice rather than through the blunt force of law. Meeting the 2020 targets will require 40 percent of residential and commercial building owners to participate, well above the turnout Daley delivered for his own 2007 reelection. Daley and Johnston knew that Chicagoans would be doubtful about an altruistic pollution prevention plan. The mayor’s constituents would have to see hard facts before buying in. So when the city began forming its climate change agenda, it performed a thorough analysis, precisely measuring what caused emissions in Chicago. The results proved surprising. Planners used GPS and satellite imagery to map which parts of town were the hottest and which emitted the most greenhouse gases. Infrared pictures showed sections of Chicago where temperatures spiked, a result of poorly insulated buildings and the absence of greenery. Those images were overlaid with maps of existing tree canopies and areas prone to flooding. From all these data, the plan’s architects identified neighborhoods where emissions cuts would have the greatest impact. They also determined that a huge amount of greenhouse gases were coming from the rail yards around the South Side. Why? A third of the nation’s rail traffic comes through Chicago, intersecting with tracks and roadways to form a bottleneck that can stall electric and diesel freight trains for days. It takes the “same amount of time for trains to get through Chicago as it takes to get here from Los Angeles,” the plan notes. A separate $1.5-billion private, federal, state and city partnership to eliminate the choke points would get rid of 1.6 million metric tons of greenhouse gases annually. Johnston’s map also indicated that buildings account for 70 percent of greenhouse gas emissions. Only 21 percent came from cars and trucks, overturning the assumption that motor vehicles are the key villains. Still, 210,000 metric tons of carbon dioxide will be saved if the city replaces its buses, garbage trucks, taxis and delivery trucks with more fuel-efficient vehicles. Hence, the plan assumes that building owners will renovate skyscrapers and factories for energy efficiency, to make them less costly to heat and cool, if adequate loans are made available—a step the city has already taken in cooperation with foundations and banks. Better insulation and new heating, hot water and lighting systems can reduce energy expenses by 30 percent. City officials note that when nine local companies recently spent a combined $277,000 to weatherize their buildings, their annual savings amounted to $100,000, covering the costs within three years. Among the Chicago landmarks already onboard for retrofits are the Sears Tower and the Merchandise Mart. The same principle applies to running a household. The plan claims that by replacing incandescent lightbulbs with fluorescent ones, homeowners would save $108 a year. Another $23 could be saved by unplugging televisions rather than keeping them on standby. More money could be found by turning down the thermostat by three degrees Fahrenheit in the winter, keeping car tires properly inflated and driving 10 fewer miles every week. These are among the 13 recommendations for how Chicagoans could change their behaviors in small but significant ways, saving themselves $800 annually in the process. If only half of the city’s residents followed the carbon-saving recommendations, 800,000 metric tons of emissions would disappear. All told, the plan lays the groundwork for an economic climate change in Chicago, as renewable energy and green technology companies begin to locate in a city openly sympathetic to their interests. This is Daley’s master plan, his bid to secure a legacy. He wants the “Windy City” sobriquet to describe a Chicago whose electricity comes in large part from wind farms instead of the past century’s smoky coal-burning behemoths. Time will reveal whether his plan is visionary or mostly hot air. Either way, Chicago won’t be fazed. Most people assume the city got its nickname from the breezes off Lake Michigan. But the phrase was actually coined in the 19th century to describe the blustery hype of Chicago’s politicians, who made bold promises at a moment of tremendous change in America. 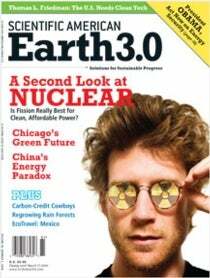 Note: This article was originally printed with the title, "Chicago Goes Green". Josh Boak is a staff reporter with the Chicago Tribune who covers energy and financial markets.